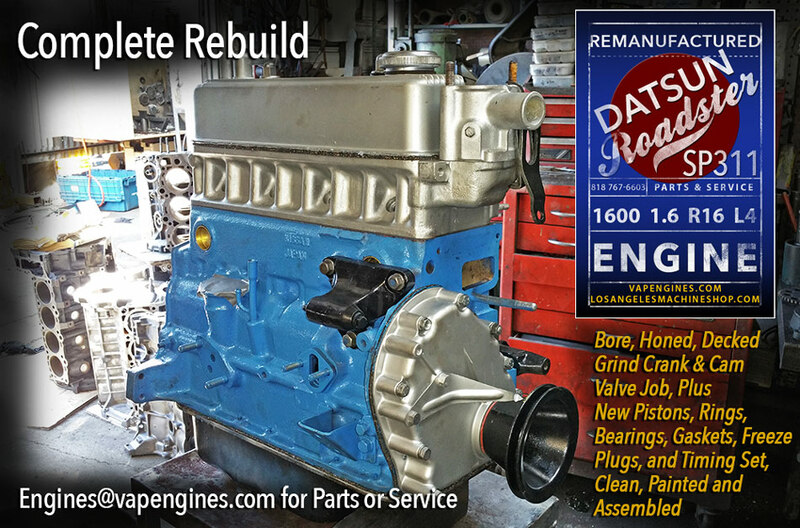 Need a Rebuild on your Datsun 1600? Datsun 1600 1.6 Engine Rebuilding. Classic Datsun Roadster 1.6 R16 engine came in for a full rebuild. 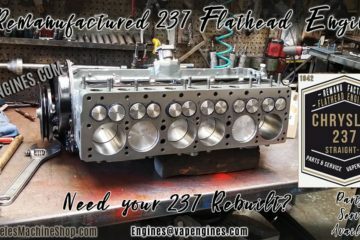 Rebuild Plan: Tear down and inspect for any damages; Hot tank and clean; Bore and Hone; Grind Crank and Cam; Valve job on the cylinder head. 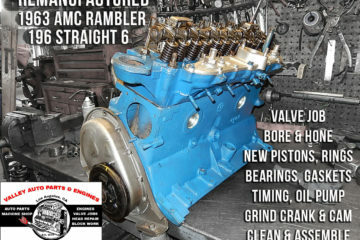 Rebuild with New pistons, rings, engine bearings, gaskets, oil pump, and timing set. Before we start the teardown, a couple of Before Shots. We’ve taken apart the components, no damage found, ready for the Hot Tank and rinse. Then we will Bore and Hone the engine block and start the Valve Job. Getting ready to bore the cylinders and finish up with the honing. 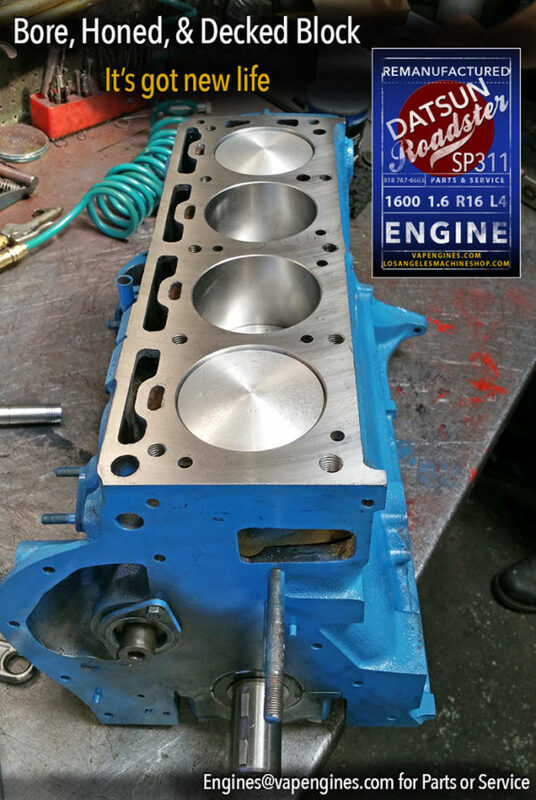 Includes: Pressure test, Magnuflux, Grind valves, Cut valve seats, Resurface, New valve stem seals and Guides, Clean, Paint, and Assemble. I missed shots of the work, but I got a few after the the Valve Job is complete. After the Bore and Hone, we Decked the block, it has a nice surface now. A few coats of paint, and we are ready for assembly. We reground the Crank and Cam already and they are ready to drop in. I shot a few pictures of the new Dome Pistons that we are using in the rebuild. It’s coming together nicely. Check out that nice sheen from the decking. 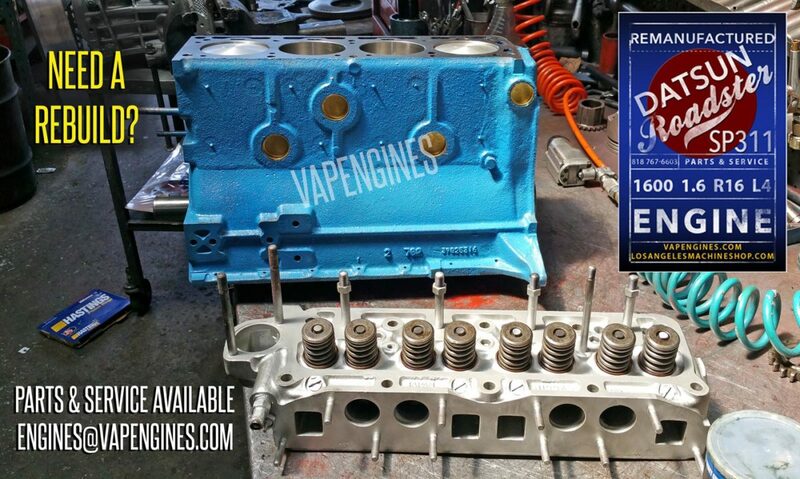 It’s time for the cylinder head and timing components to complete this engine rebuild. 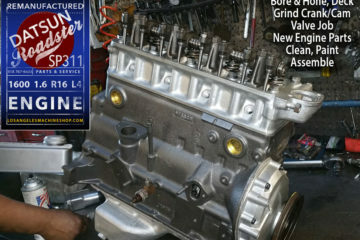 Need Your Datsun 1600 Engine Rebuilt? 818 767-6603 for an Estimate! 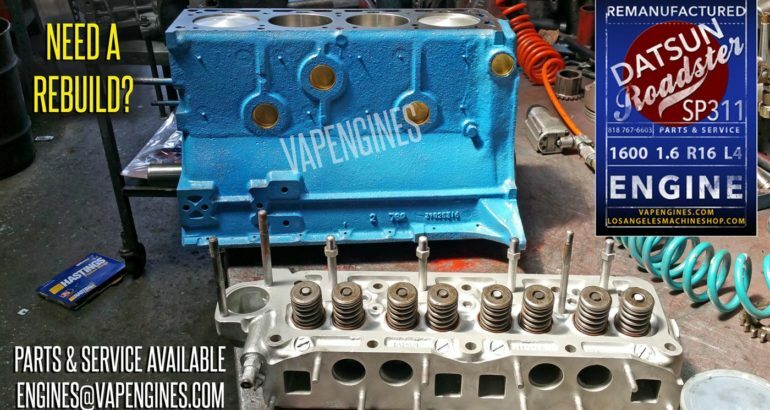 Get your Datsun Roadster engine rebuilt, just like you see in the photos. The engine is complete and ready for pickup. Teardown; Inspect; Magnuflux; Bore, Hone, and Deck engine block; Grind and Polish Crank and Cam; Valve job, New Pistons, Rings, Bearings, Gaskets, Freeze plugs, Oil pump, and Timing set. Clean, Painted, and Assembled. Extra parts given to customer for installation. Get the same rebuild for Your Datsun 1600 Engine or Engine Parts for your rebuild. Call us at 818 767-6603 to discuss. 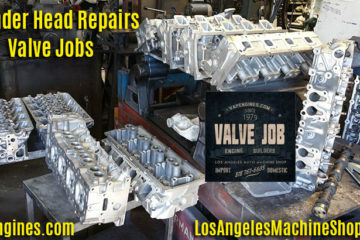 Use the CONTACT form to email us for a rebuild estimate or engine parts.